A bunch of us have this, right? A water closet inside our big master bath. Nothing is nearby. No cabinet holds extra rolls of toilet paper, no vanity holds reading material. Anything you need to reach while on the seat is very far from you, so forget about it. I had a little time so I figured I would toss some shelves up behind the toilet. Water Closet DIY shelves - super easy! Yes, the picture is awful, camera phone, tiny room, blah-blah-blah. But you get the idea. Here is how easy it is. Really, you have no excuse. I bought a couple of boards at Lowes - 1x10 or 1x12, I can't recall. Either will work. Then I bought some 1x2 for the supports. I also bought toggle bolts made for drywall - these suckers are going to support whatever we put on them! Remember to buy the washers you'll need with the toggle bolts, or you'll get another trip to the store, like we did. We did not secure the boards to the supports. This way if we need to move them to paint, clean, or do repairs it is easy. The measurement for our shelves was 31.5 inches. Yours may vary, even in a Ravenna - make sure you measure the front and back of your wall. Chances are the measurements differ a bit. A sander would likely be enough to make the difference in a pinch. I painted everything with Annie Sloan Chalk Paint in Old White. I love the color and it's pretty much a match to the walls. I sanded it down a lot after painting because I love the wood grain showing through. The only thing I wish I had done, but missed, is giving the screws and washer a quick spray of oil rubbed bronze so it would match the rest of the hardware in the house. 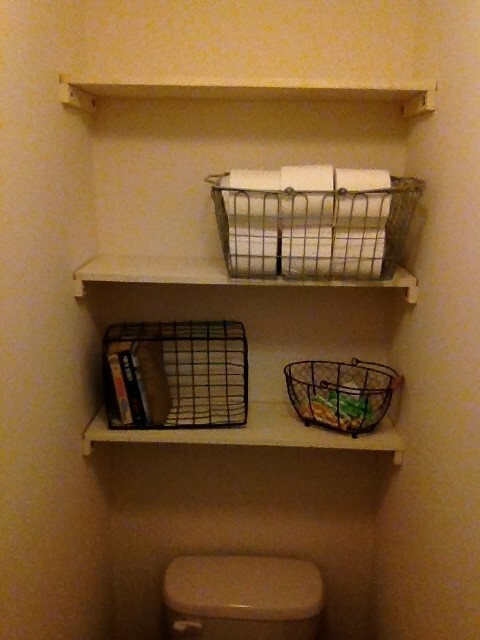 So, if you have a couple of hours you can easily have some toilet paper & reading material storage in your little water closet, too. This will also serve as extra towel storage, which our bathroom was sorely lacking. this is a good idea that I have been working my wife on. I think a couple shelves over the pooper is ideal for your reasons. If I can make a couple suggestions as I have built a few of these. Running a 1x2 across the front will keep the shelf from sagging over time. Also, a piece of trim (or 1x3 with lightly sanded front edges) covering the front and flush with the shelf will dress it up nicely; and hide the wall supports. I will get some trim when I find some I love. I haven't decided which way I'm going decor-wise, so they're like this for now. Our built in bookshelves in the office have me sick of looking at trim for now. I'll share those later, once we get the crown in place. Tell your wife I said she definitely needs at least two shelves. Where else is a body supposed to stash the spare roll? These toilet tanks are curved on top, which doesn't allow for placing things on top of them. Consider a piece of 1x3 or 1x4. Sand the edges or leave sharp. Add paint. Very simple and doesn't overstimulate the brain with trim options. Love the idea! We have a similar nook in our laundry room that I wanted to hang baskets in like another blogger did but the width is too long so I think this is my answer! Thanks for sharing!